I n my freshman year of college, my classes were mostly at Ballantine hall, which was rumored to be built from all the money IU made off of the fluoride patent they sold to the Crest toothpaste people. The morning stumble from Collins to Ballantine for an 8:00 German 100 class took maybe five or ten minutes, but I somehow decided that I’d die of exposure, so over the holiday break, I became obsessed with the idea of heated socks. I somehow thought a pair of wool footwear impregnated with electrical coils would be the difference between Rolls Royce comfort and dying like those soccer players in the mountain plane crash who had to eat each other’s dead bodies. I went to K-Mart back in Elkhart, and bought a pair of these magical socks in the hunting department. They were brown with olive drab green trim on the toes, and a little plastic compartment for a C-cell battery in the top cuff. I brought them back to school, put in a set of duracells, and within two minutes, it felt like a case of thermonuclear athlete’s foot, like the Vonnegut character that sealed his feet in clear plastic toxic waste. And then two weeks later, it was suddenly 78 degrees outside, and people were sunbathing at the end of January. I practiced cello outside the IMU on the bank of the Jordan river and got my picture in the school paper. It must have been a slow news day. That was my second cello. I had to leave my first cello in the dorm over the holiday break. They ran the steam heaters full blast, so I locked the cello in the closet with a bucket of water, two drenched towels, and two humidifiers in the f-holes. When I came back three weeks later, it was all bone dry, and the cello had a huge crack in it. It was a rental, so I brought it back and exchanged it for another one. I never really knew how to play; I just took a semester of lessons in some fit of stupidity, the same kind of spontaneous freedom that causes a person to buy a pair of heated socks at K-Mart for a five-minute walk in 38-degree weather. I also purchased a 35mm camera that break, although I don’t think it was from K-Mart. It was one of those fixed-focus point-and-shoot things, all plastic and manual. I think I got maybe three rolls of film through it before the film spool broke, and I could not fix it. I took a few good pictures of the campus, though. And even though it had a plastic lens and no motor drive and no zoom or anything like that, it took pictures better than any camera I’d had before that. My prior photographic history resembles a list of every failed film technology invented. My parents had a 135 camera, and then I got a 110, and we also had a Polaroid one-step, and later graduated to a disk camera. I don’t know if they ever got one of those APS models, but I wouldn’t doubt it. We’d take about a roll of pictures a year, and then throw all of the rolls in the junk drawer and never develop them. On the rare occasions when a roll got processed, the pictures went in a sticky-paged album with a faux leather cover, which would then reside in this hexagonal end table in the living room, to be produced each time I was stupid enough to bring a prospective girlfriend home to meet my parents. It’s depressing that people will soon forget the extreme frustration of living in the film age, of having to bring film to the drug store, needing to buy those flash cubes or flash strips that exploded in bright light with the faint smell of burning electronics, like igniting a dollar bill every time you pressed the shutter. You’d worry about the film getting exposed to light and destroyed, the possibility of a door opening or a case splitting, exposing everything and fading the captured images to nothingness. Unless you owned an expensive camera with a motor drive, you’d follow some ritual of ratcheting a thumb wheel to advance the film from one reel to another, hoping you didn’t crank it too far and miss a picture, or you’d forget to turn the wheel, and when it was time to snap the shutter, the mechanism would deny you until it was wound further. And then you’d wait a week or a month or a year and get the prints and realize everyone had their eyes closed or you were too far away or the shot you thought was perfect didn’t frame up anything like the crappy little viewfinder convinced you it would. I developed film once. A girl I dated that freshman year found some old 35mm film at her parents’ house, the aforementioned spools of film in a junk drawer for decades. Her dorm had a darkroom, and she knew someone who took photography classes or worked for the school paper or something, a guy with the knowledge of all of the various chemicals and trays and tools and red-filtered lights. We unrolled this ancient spool while hiding out in this little closet of a lightproof room, breathing chemical fumes and watching the pictures slowly appear. It felt like when you make the Paaz easter eggs as a kid, when you scribble on the eggs with white crayons and then dip them in the bowls of dye and watch the inverse of your writing slowly appear in color. We watched these pictures of Toledo fade into view, images of a lake shore now covered in condos and strip malls, but then barren. I don’t remember how the process worked, except it seemed magical to me. I keep thinking about buying a film camera for kicks, an old East German plastic-lensed thing that hipsters use to take pictures of skateboarders and graffiti and abandoned buildings. I know I would never use it; I almost never use my real digital camera. But there’s something enticing about it, like any of my other craft-related obsessions I avoid because they are money drains. I still obsessively google old camera pages, and think about Super-8 and Polaroid film. I know I’d have to pay more per picture, and then I’d have to scan those pictures, and I have boxes of thousands of pictures I will never scan, and I’d only end up with more blurry pictures of my cats laying on the same furniture. But the process of it all makes it hard to shake. 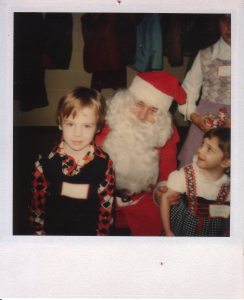 I should probably start by actually scanning the old pictures I do have, before I sink any money into this.